This has been a busy year. In the plot, I have grown a few new crops: oca, achocha, shark fin melon, salsify, scorzonera. And the year I tried seaweed meal as a soil conditioner and cardboard mulch in autumn. The year I planted more fruit bushes because I think perennials are much less effort and crop well (with the exception of strawberries, slugs' favourite meal over the summer). I have achieved my RHS Certificate in Horticulture and moved on to study horticulture at a higher level. I have also been on the plot rather little, considered how much time I had available - one excuse was the rather dreadful summer, with rain nearly every day for all of July and August. But I have cooked a lot more, with more ingredients and learnt how to bake sourdough, make yogurth and my own curries (I started with this book, which I really recommend). This was the year I decided that I am going to shift my career to work in sustainable agriculture and food production (it might take a while, but I will do it, because that is what I am ultimately interested in). Carl Legge, who someone called a "Renaissance man", about whom I have talked before and half whose library contains books that are in mine too. Except Carl also reads them, and develops a wealth of knowledge about permaculture, food and human behaviour. In his Welsh paradise, shared with sweetest and sharp wife Debs and loveliest son, Carl is almost self sufficient, thanks to his extraordinary creativity. Generous with his time, knowledge and produce, Carl also set up the Seedy Penpals seed exchange scheme. Joanna of blog Zeb Bakes, is a great baker, inquisitive cook, kitchen tools' geek, owner of a lovely poodle, gardener, and a lot more. To me, she's been a generous, helpful, supportive and understanding friend. Pietro Parisi, "the farmers' chef" as he likes to think of himself (or a chef de terroir as a French would say), is a Neapolitan born, internationally travelled chef who loves his native region and the local farmers that still produce traditional fares in the traditional way, but risk being swept away by the modern food system. Pietro, through his restaurant and as many initiatives as he manages to take part in, is keen to share his knowledge of traditional cooking and preserving techniques with everyone, to inspire a more sustainable way of eating and producing. A Slow Food prize winner, Pietro has recently cooked for ex French president Sarkozy and writer Daniel Pennac. Sonia Piscicelli, the author of the Italian blog Il Pasto Nudo and of recently published book Cooking, responsibly (which I had the pleasure of translating into English, for a Feb 2013 release). Sonia loves her food, which, she believes, is not just what we stuff our mouth and fill our bellies with, but the means to keep us healthy and active: that is why she chooses locally grown, fresh, organic or biodynamic, and home cooked. One of the things I have realised this year is that producing food is inextricably linked to cooking and eating it; and both growing and eating food affects our health. I am thinking of relaunching the blog next year, to deal with those wider issues. Just thinking about it for now. But I came on the blog to share with you what I ate for lunch - my first ever meal of salsify (Tragopogon spp.). They say it's also called oyster plant because that is how it tastes. I am not sure about that, but I loved it. With an unobtrusive taste (much like a potato's), and a crunchy texture, I found the flavours linger in my mouth lusciously at the end of the meal, so much so that I did not feel like coffee. The recipe is Hugh Fearnley-Whittingstall's for the BBC I have adapted it for my lunch alone today. Salsify ain't too pretty or easily handled. My roots were knobbly, having grown in flinty soil, so they stuck to mud. Once cut, the roots ooze milky sap, and oxidise immediately, becoming an unpleasant shade of brown (acidulated water is no use either). This however gets fixed once they start cooking and the colour improves. 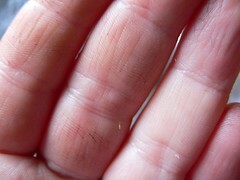 Your hands, however, will retain an unpleasant tinge of ochre. Is it worth it? Definitely. Coarsely grate the roots. I found a box grater works well. Heat a small cast iron pan with half the butter, and cook the salsify until softer. Separately, quickly whisk the egg, add the garlic and chilli. Pour in the salsify, add the flour and mix well. 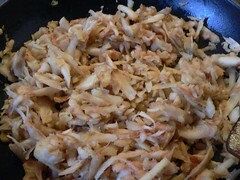 The mixture is rather loose, but will stick together once fried. Using the same pan, melt the rest of the butter and add the oil. 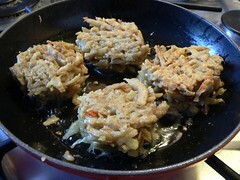 Make four fritters out of the mixture and drop them in the pan carefully. Once the bottom is well fried and sticks together, turn the fritters on the other side and cook on. I have used the smallest hob throughout. You can buy salsify seeds from the Garden Organic Catalogue. and to a happy New Year of gardening and cooking!